This is part one of a multi-part series titled “Limiting Factors – A Genesis of Blood Doping”. It comes to FasterSkier from Sammy Izdatyev. Even when the following essay is an original work by the author, no rights are reserved and therefore it is a work of public domain and can be quoted, distributed and copied freely. The use of copyright material by the author has been kept at the minimum level in order to illustrate a complex viewpoint or to prove that a certain material referred to actually existed in the first place. What is blood doping? This vague term refers to any illicit method to increase the number of red blood cells containing oxygen-carrying hemoglobin, which is very important in endurance events. The method of the day in the earlier eras was a simple transfusion of one’s own red blood cells which had been stored from earlier, or otherwise-compatible, blood. Scientific progress has later given methods to directly stimulate bone marrow to produce surplus red blood cells, rendering reinfusions somewhat old-fashioned. The best known of these methods is the synthetic version of the hormone erythropoietin, which directly regulates the production of red blood cells. While it is debatable how prevalent blood doping is today, it is undeniable that we live in an era when everyone is focused on blood values of athletes. That includes doping testers trying to catch the cheaters. It includes the public seeking sensational scoops about the past. And it includes athletes themselves who simultaneously fear anemia (an illness resulting from lack of red blood cells) and who want to keep the number of oxygen carriers in their blood as high as possible to gain an edge in endurance competitions. Former elite-level cyclist Tyler Hamilton recalls in his best-selling memoir The Secret Race a team doctor measuring his hematocrit level in the mid ’90s, when the abuse of the red-blood-cell-boosting hormone erythropoietin was endemic. (Hamilton & Coyle, 2012) Hematocrit is the relative amount of red blood cells in blood, the normal healthy reference values for men and women being 40-54 percent and 36-48 percent, respectively. “Not too bad — you are 43,” the doctor told him. The same doctor also told another rider that to be a professional cyclist in Europe, one must “be” 49 percent or maybe 49.5 percent. That isn’t just Saltin’s opinion. Many national teams did “bother” going to the 2001 FIS Nordic World Ski Championships. When blood samples from the endurance events were later analyzed by a group of blood-doping specialists, they didn’t give a good picture of the sport. Instead, they indicated that the faith in elevated hematocrit count was prevalent at the highest levels or more worse – those with the most manipulated values tended navigated disproportionally into the highest echelons. “The results of this study suggest that blood doping is both prevalent and highly effective in cross-country ski racing,” the authors concluded. While the modern mindset sees this connection between hemoglobin and endurance performance almost self-evident, the way that even the most brilliant minds looked at the issue was different only some 40 to 50 years ago, when nobody cared that much about blood values and one open question was whether blood donation had a detrimental effect on performance. There were diverging opinions on what, today, seems like an obvious question. 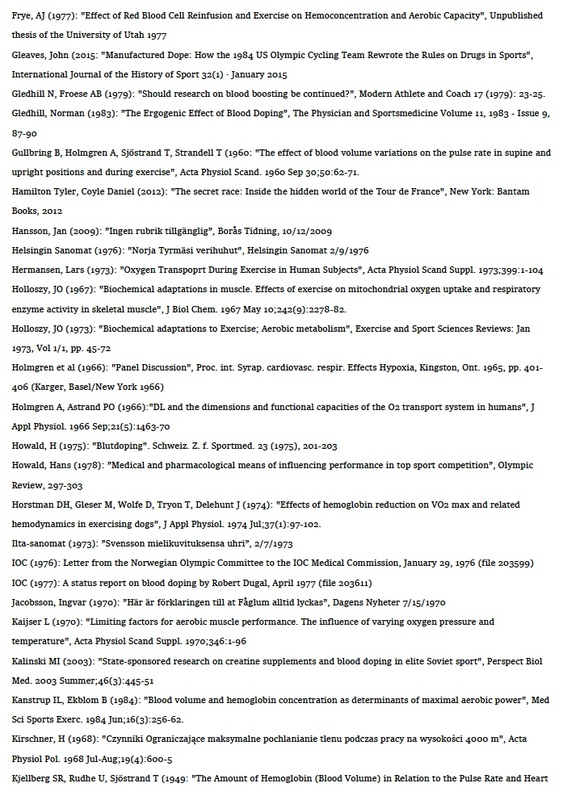 Even though there is a huge body of literature in journal articles, documentaries and books on practically every subject of performance-enhancing methods, very little attention has been paid to the origins of blood doping. Usually, it is discussed as given and “already-known” method. The minuscule amount about its details is usually recycled old information from secondary sources. The picture described is occasionally wrong, often incoherent, and sometimes even contradictory. Correspondingly, there exists no real consensus on when, where, and even why the method was invented. Though a clear majority see the early 1970s as the watershed time period and the 1968 México Summer Olympics at high altitude catalyzing research in the area, other academic researchers claim that the method saw the light of the day significantly earlier, possibly as early as in the 1940s. To fill this gap in the literature, in the following essay I will attempt to provide the background story about how and why “blood doping” was invented. My conclusion is that the standard version – that the method originated in Sweden around 1970 as a result of research that had started about half a decade earlier – is largely accurate. While it is borderline impossible to prove negative, that the method wasn’t known earlier, here I can detail a plausible scenario for this standard version of events, and also raise questions that would challenge the revisionist perspective which puts the timeline significantly earlier. This is a question which is actually two questions. First, why did a group of primarily Swedish exercise physiologists find it interesting to research how the human body reacted to the increase in the amount of the oxygen-carrying red blood cells? What was their motive and the road that led to this? The other, equally interesting question is why the research started in the mid-’60s and not earlier or later. Why were both the pre-existing research and trends of the era such that blood doping was suddenly a logical topic to take under scrutiny? “No man is an island,” says the old proverb expressing the importance of being a part of a community in order to thrive. This holds more so true in the case of blood doping research, whose predecessors had built the foundation of their research little by little, usually with inferior technology but sound logic, intuition, and extrapolation, so that their conclusions that were more often on the track than not. Still, there were elements that made the blood doping research of the late 1960s in many ways unique. The endeavor wasn’t a straightforward process. There was no lack of setbacks or loss-of-faith moments, as we shall later see. Parts I and II will provide background information on the blood-doping research project, how the primarily Swedish scientists ended up researching the unusual subject matter in the first place and what were the future prospects of the research. Parts III and IV focus on the actual blood-doping research process that took place in Sweden and on how the method became ”invented”. Parts V and VI explain how the research was received internationally when blood doping itself emerged as a subject of heated debate worldwide while the scientific community’s interest was lukewarm at best. While I have attempted to keep the essay chronological and focused primarily on the blood-doping trail, some other research trends, as well as the developments in the sporting field, are also discussed as they relate to ongoing blood-doping research. It should also be emphasized that despite the science behind the topic, this essay is partially based on the subjective recollections of the participating scientists, so this is may not meet the strict academic standards of a scientific journal. The look into what media and the commentators of the era wrote is also mostly to illustrate what kind of discussions took place at all. In some instances, there can be a larger trend behind an isolated article, but unfortunately, occasionally some news items can really have been minority opinions. *The remarks and recollections of Dr. BjoÅNrn Ekblom are based on email correspondence and on interviews that took place in 2018. His earlier views and remarks are distinguished from his present views with source references. It can’t be emphasized enough that this essay would not have been possible without his collaboration and interest into the subject matter, and I am very grateful to him for his interest in recollecting items that in some instances took place more than fifty years ago. Even though young Björn Ekblom showed interest in both sports and medicine, there was little indication that the Swedes would become a famous sports doctor and exercise physiologist and a coauthor of a total of five published research papers on the topic of blood doping. His sports interest was orienteering, an endurance sport most popular in northern Europe and not particularly well known outside Europe. It is essentially cross-country running between checkpoints through hilly and rough forests with help of a compass and a map. Though the sport has its strategic elements because wrong and suboptimal routing can cost both time and energy, the physiological demands are very high and similar to that of other endurance sports. When Swedish exercise physiologists conducted various tests on orienteers in the 1960s, their physiological capabilities were as good as those of the runners. Unsurprisingly, orienteering has been a good summer competition venue for cross-country skiers, and most elite level orienteers succeed in other endurance sports. Perhaps the most famous is steeplechaser Anders Gärderud, who broke world records and became an Olympic gold medalist in 1976. I got interested in endurance sports because I knew how performance shifted from time to time. It was so interesting that one week you feel weak and the next week you are in top shape. It was interesting to find the factors that cause that. Ekblom was even occasionally mentioned in the sports sections of the largest Swedish daily newspapers in the mid-’50s, well before his days of international fame. Even while a member of the Swedish national team from 1959 until 1971, his main professional interest wasn’t sport or exercise physiology. Instead, he wanted to become a surgeon. I started to feel very bad and lost consciousness when they treated me, and I was rushed into the hospital. The guy who drove the car asked me what I did normally. I said I was studying to be a medical doctor. Then he said that ‘You should come to our laboratory; you are interested in physical activity.’ I remember that I was dizzy. That guy who drove the car was Bengt Saltin. Bengt Saltin – then also in his mid-20’s – would become a famous exercise physiologist. The laboratory he mentioned was GCI (Gymnastiska Centralinsitutet), an institute renamed in 1966 to be more commonly known as GIH, Gymnastik- och Idrottshögskolan (the Swedish School of Sport and Health Sciences). It was a fortuitous meeting for Ekblom. Saltin, who was also an accomplished orienteer, would serve as the president of the International Orienteering Federation some 20 years later. But that was not their most important connection. Saltin would become Ekblom’s close colleague and an occasional co-author. He long maintained a healthy skepticism about the idea of blood doping, while never being an outright skeptic dismissing the findings of his younger colleague. When Ekblom visited the laboratory a few weeks after his first encounter with Saltin, he also met professor Per-Olof Åstrand, who would become his mentor and regular coauthor. Åstrand had already published multiple research papers which became references for later work, and he would go on to co-author the foundational textbook on exercise physiology that many consider the first on the issue. He was so friendly and helped me in all instances and considered that I was at the same level as he was. When I first read his  textbook – I even read some pages before it was published – then I understood, that he wrote things in that first edition of the textbook, that was not [yet] really scientifically proven. This guy is fantastic in the way he summarized the current knowledge of physiology. The specific time period when Ekblom literally by accident ended up studying exercise physiology at the GIH coincided with two trends that would change the direction of his own research career. The first was the more scientific approach to training that was spreading to the practical level. The unscientific trial-and-error methods of training simply weren’t enough to guarantee success anymore. This trend was most clearly seen in cross-country skiing. Whereas Swedes had won every single cross-country skiing event at the 1948 Winter Olympics with more traditional “natural” training methods, they had a disastrous 1952 Winter Olympics in Oslo, where their only medal from cross-country skiing was bronze in the 4×10 km relay. Afterward, the Swedish Ski Federation approached the GCI and proposed working on a more scientific approach to training. Cooperation between the GCI and elite level cross-country skiers intensified. The chief of the institute at the time was Danish physiologist Erik Hohwü-Christensen, who agreed to the new plan in part because he was eager to have access to truly elite level subjects for tests. The other trend was what a change in what was actually measured by physiologists and exercise scientists because the emerging field of exercise physiology took a very systematic interest in the concept of maximal oxygen uptake. Looking back, it has been observed that interest in the concept, as well as its limiting factors, had started to intensify exponentially in the 1960s. This was seen both as a practical problem and as an academic venue, as new technology made it possible to measure many functions of the human body more accurately than before. In this context, the most recognizable name in the blood-doping research left the idea of becoming a surgeon behind and ended up focusing on exercise physiology. Because maximal oxygen uptake is so much at the center of this story, it is a concept that should be given a deeper look into what it actually is and how it relates to human performance. Both the popular and scientific literature on blood doping literature are, have been and probably always will be tied to the concept of maximal oxygen uptake like Siamese twins, for two reasons. While the ultimate goal of “blood dopers” is to directly influence performance, this mechanism takes place through elevated oxygen flow into the working muscles. When blood doping research took off, almost all blood doping researchers focused on maximal oxygen uptake. Peer-reviewed published time-trial performance research has always been almost nonexistent because it is time-consuming to organize and maximal oxygen uptake is a good proxy for performance: it is relatively easy to measure, and maximal oxygen uptake is very much beyond the influence of any mental factors. It’s a purely physiological measure, unlike competition performance. Then what actually is maximal oxygen uptake, or VO2max, and what was known about it in the mid-’60s when the blood-doping research started? Maximal oxygen uptake is the uppermost limit of the aerobic engine at a given moment, the highest amount of oxygen that both can be delivered to the muscles and that muscles can use. The term and the concept were coined in the early 1920s. Many modern incremental test protocols also stem from this era, as does the idea that the “relative” VO2max – that is to say dividing the VO2max by weight – is a better figure in order to evaluate fitness. Because both oxygen uptake and oxygen demand tend to increase proportionally with body dimensions, just focusing on the absolute figure isn’t so informative: knowing that someone has an “oxygen engine” with the size of 5 litres and another one with 4 litres doesn’t convey that much information if it wasn’t known whether the former was double the size of the latter. The interest on the subject went forward both on the level of fundamentals and on the applied level during the 1950s and ’60s. The first indirect method to estimate the figure was published in 1954 by Åstrand and his colleague Irma Ryhming. The simple and clever method consisted of exercise at different submaximal heart rates with low effort and then estimating what the output would be at maximal heart rate. It was prone to later revision and fine-tuning but is still the basis for similar tests used today. 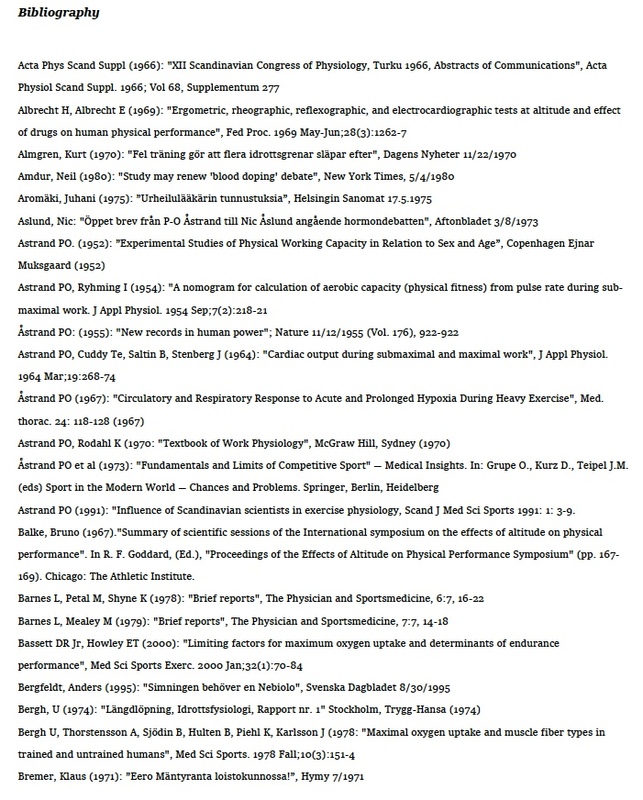 Whereas the data on elite-level athletes had previously been still scarce, researchers all over the world started to systematically test elite athletes during the decades following the World War II, and these results were also published more systematically. Åstrand and his colleagues tested a group of Swedish cross-country skiers during the 1955 national championships shortly before a race. From highest to lowest, they got figures of 81.7, 81.3, 80.3, 79.1, and 78.5 ml/kg/min from the tests, and the athletes went on to have corresponding positions in the final results in exactly the same order. (Åstrand, 1955) The highest figure was breathed into the Douglas bag by Sixten Jernberg, who would later become arguably the best cross-country skier in the world by winning total of eight gold medals in the Olympic and World Championship venues. Only 10 years later in 1965, Saltin and Åstrand reported that Swedish cross-country skier Assar Rönnlund tested the unofficial VO2max “world record” with his 85.1 ml/kg/min. He was also an Olympic gold medalist and one of the best cross-country skiers of the ’60s. And only a few years later, another Swedish cross-country skier, Sven-Åke Lundbäck, a 1972 Olympic champion, broke this world record with his 86-87 figure and even later another barrier by going beyond the magical 90 limit. While Saltin and Åstrand considered VO2max important in their paper mentioned above, even they didn’t call it “the” but “a” dominant factor, because everyone was still aware that there were other factors influencing performance. While there has been exponential interest into the subject of maximal oxygen uptake since the ’60s, it was also well known that the figure wasn’t the be-all-end-all, because a one-to-one correlation between oxygen uptake and performance just wasn’t there in the data. When collecting data from their own laboratory about elite level athletes for the aforementioned study, Åstrand and Saltin appear to have been somewhat surprised that the highest figures they measured weren’t higher than those from the 1930s, even though running records had been shattered in the intervening thirty years. He was the guy who started the discussion in Sweden about the lactate threshold and 4 mmol/l running pace, both as a figure of measuring performance and also for training at the lactate threshold, that the distance training should the most efficient at that speed. It was not regarded as serious to start with, but he continued and then suddenly he noticed that performance at long-distance races were related to speed at 4 mmol/l lactate. The strange thing is that those with the best running economy also have low relative VO2max, so if you could combine the best running economy with the highest VO2max, marathons would be run by one hour and fifty minutes or something [like that], but it is strange that these two figures don’t seem to fit in the same body. The current marathon world record is slightly over two hours. ”This is a strange physiological finding”, Ekblom adds and thinks that while the issue hasn’t ”really been explained”. His view is that the phenomenon might have its cause at the periphery and mitochondrial level and about oxygen affinity to hemoglobin and the P50-value, a value much interested by physiologist which shows the oxygen tension in which half of the hemoglobin is saturated. *One under-researched area is the mechanism of how submaximal performance is increased after blood doping — because the performance boost is significant in endurance events that are performed below Vo2Max effort. Why not infinite oxygen uptake? As early as 1923 it was noticed by physiologist A.V. Hill and his colleagues that there was an upper limit in maximal oxygen uptake of a subject. This observation stated by Hill raises an interesting question: what actually causes maximal oxygen uptake to be what it is, and what are the factors that limit it? This seemingly simple question can be understood in at least two ways, both of which deal with the phenomena of plateau, the leveling off and response to exercise. From one viewpoint, it has always been interesting why some people have a naturally bigger “oxygen engine” than others. What are the limitations of trainability? How much can training really change the size of the engine? This is an interesting question today, and it certainly was already some fifty years ago. “I am convinced that anyone interested in winning Olympic gold medals must select his or her parents very carefully,” Åstrand stated during one of his lectures in 1967, a point illustrated when physiologist Sidney Robinson (who had tested 2-mile world record holder Don Lash) later tested Lash’s 15-year-old son. The teen had a very huge aerobic engine even though he didn’t participate in athletics. The other equally interesting perspective and perhaps more relevant for training is to focus on why maximal oxygen uptake is such and such at any given moment. One can think of the human body as a snapshot, focus on the different factors that are affecting oxygen uptake, and consider their relative importance. *This model is based on the one used by David R. Bassett and Edward T. Howley of the University of Tennessee and in their 2000 essay. (Bassett & Howley, 2000) It is, of course, anachronistic, because when eminent physiologist researched the subject before the late-1960s, oxygen carrying capacity wasn’t considered an independent link. The first item is linked to the lungs’ capacity to saturate the oxygen-carrying red blood cells that keep constantly flowing through the lungs. Because oxygen is tied to the oxygen-carrying red blood cells, heart function and oxygen carrying capacity are both about oxygen delivery. The second and third links are related to the circulatory factors of which the interesting is the maximal pumping capacity of the heart, expressed usually as stroke volume and the minute volume, called cardiac output, which is just stroke volume multiplied by heart rate. But just pumping liquid through the body isn’t that interesting, so the oxygen-carrying capacity of blood is also an important link in the chain and the upper limit of the oxygen carrying capacity is set by the concentration of oxygen-carrying red blood cells. The fourth item is what takes on the periphery, both the release of the oxygen from the hemoglobin molecule and the capacity of muscles to use this offered oxygen. Even when the intuition tells that the maximal power output of muscle isn’t reached in endurance type of activity, there exists an exact component of muscle that consumes the oxygen and these units aren’t infinite in number. peripheral factors (4). According to ”Fick principle”, if one knows the oxygen content of the arterial blood (red arrows), venous blood (blue arrows) and cardiac output ie. how much blood the heart pumps every minute, one can also calculate maximal oxygen uptake by simply multiplying the cardiac output by the difference of the arterial and venous blood. Almost as soon as these factors were identified, so too started the debate about the relative importance of each link. The quest was and has been to identify which of the links was the so-called “bottleneck,” if there was one, preventing maximal oxygen uptake from being even higher or the link that caused Vo2Max to fell most when its capacity was manipulated down. One way to understand the importance of each of these links and the interplay between them has been to manipulate them in different ways and look at whether the other links compensate for the diminished or increased capability of one link, or whether there is any effect on total oxygen uptake. There had been some unorganized manipulations of the links even before the early 1960s when Ekblom entered the GIH. Of these, the more thoroughly researched were methods that had subjects inhale mixtures containing more oxygen than regular air and resulted in a marked increase in maximal oxygen uptake. It was equally known that the opposite took place and that exercise capacity was impaired at high altitude where there was less oxygen available. As one brilliant illustration of deductive reasoning that followed these observations early on, researcher Roger Herbst of the “Sport Hochschule” in Cologne reasoned in 1928 that the increased maximal oxygen uptake when oxygen-enriched air was inhaled also proved that the key limiting factor couldn’t be the peripheral muscle capacity of muscle to use oxygen, because the muscles could clearly use the extra oxygen – otherwise there would be no increase in VO2max. Lowering blood-hemoglobin concentrations had also been researched and in the context on how blood donation affected performance, but the focus hadn’t been on maximal oxygen uptake, as such was rarely measured, and the results were surprisingly inconclusive from the viewpoint of what we currently know. While the manipulation research had its limits when Ekblom entered the GIH, one of the links that could be manipulated– namely the blood-oxygen carrying capacity – would have a central part in the story how blood doping emerged. One more functional definition of blood doping in the 1970s was simply transfusion, so what does the almost vampiristic meddling with blood bags has to do with understanding on the links of the oxygen transport chain and the question of whether peripheral or central research factors limit VO2max? While even up to now surprisingly little has been published about the origins and purpose of this blood-doping research, the simple answer is this: everything. 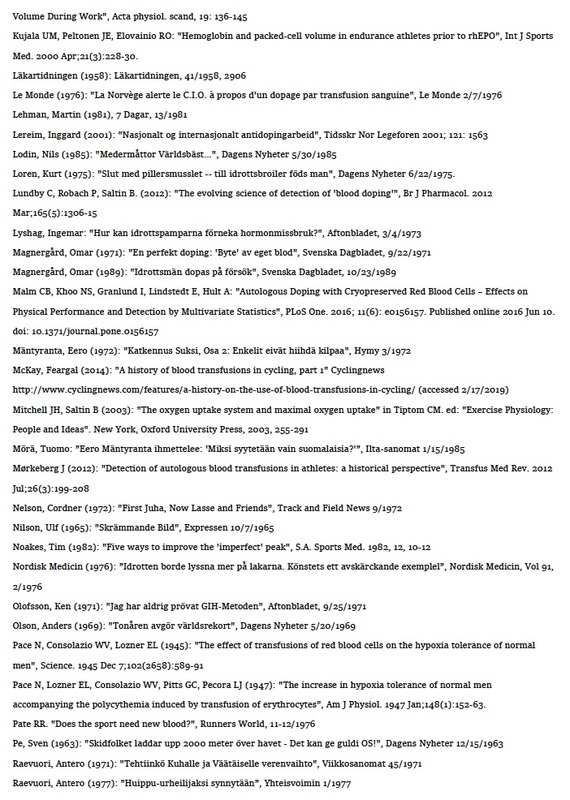 As one could’ve expected from the above, in essence the research was conducted in order to understand the relative importance of the oxygen-carrying capacity as a limiting factor for oxygen uptake by manipulating blood hemoglobin content downwards (blood removal) and later upwards and above normal level (blood reinfusion) and to see how it affected the other links in the oxygen delivery chain and whether there was an increase in fall of oxygen uptake and to measure the magnitude of the change. While lowering hemoglobin concentration was expected to have at least somewhat negative effect on maximal oxygen uptake, the opposite was more of a question mark because hemoglobin concentration hadn’t been manipulated upwards previously. Indeed, there could have been many ways that the increase in oxygen carriers – that is, red blood cells – could have turned out to be futile from maximal oxygen uptake viewpoint, or that it could even have had a negative effect. 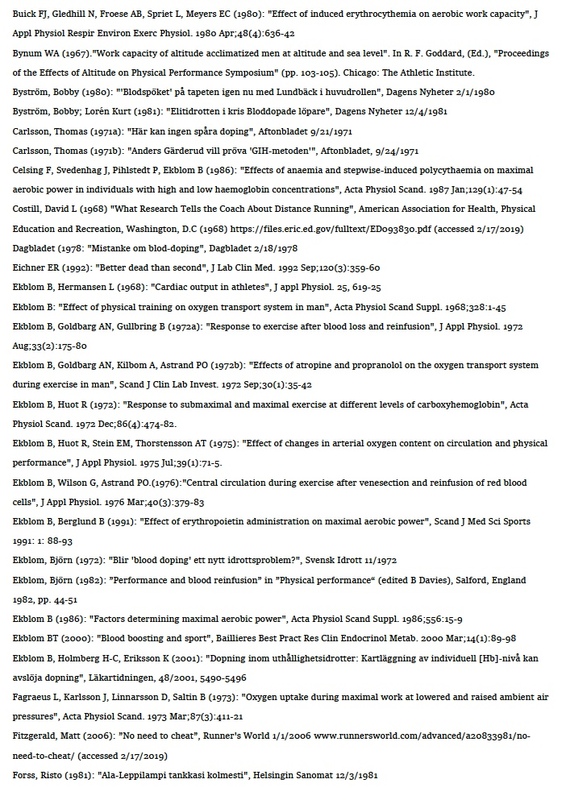 Thinking back to the links in the oxygen uptake chain, each had uncertainties in the context of such manipulation and there were even three other links involved even in the most simplistic views of the system. For example, lung capacity isn’t usually considered an important bottleneck at sea level. But while the data collected partly by Ekblom himself during the ’60s would show that red blood cells tended to be well-saturated during sea level exercise among elite athletes, it was also seen in some studies from that decade that some desaturation could take place even among athletes who were clinically healthy people. If a relatively large portion of pre-existing hemoglobin molecules flowing through the lungs couldn’t find an oxygen molecule to attach to, the situation wouldn’t become better if there was even more competition for oxygen in the lungs. Another open question was whether the heart could keep blood flowing sufficiently, or whether cardiac output would be impaired by the addition of hemoglobin and blood becoming more “viscous”. As we shall later see, there were various logical reasons to think that there could be problems in heart adaptation, and most likely almost all hematologists and cardiologists held the view that adding red blood cells into the ”normal” bloodstream would have no benefit, perhaps to the contrary. 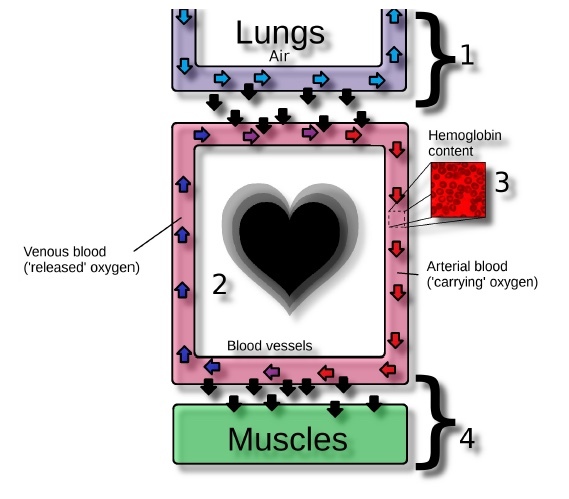 Finally, even if there was an increase in oxygen flow to the muscles, it was always possible that the peripheral limitation theories were in the end sound and regardless of the larger oxygen flow to the muscles, there was no capacity to use this extra oxygen ”offered” but the red blood cells returned to the lungs still the oxygen molecule attached to them. While it looked as if Vo2Max could be determined by the amount ”offered”, the blood reinfusion research took place on the margin and it was possible that this correlation didn’t hold when oxygen carrying capacity link was manipulated up. So the research was partly about the adaptation of each link and a subquestion was the importance of oxygen delivery vs. oxygen extraction by the tissues. And it could have been true that the ”central” delivery theory was sound, but that elevated hemoglobin concentration influenced the other central links in a such a manner that there was no extra oxygen offered to the muscles, so that there was no limiting factor at the “end”, but that the negative changes in the other links in the oxygen delivery-chain caused no extra oxygen ever to reach the muscles despite the higher hemoglobin concentration and theoretical oxygen-carrying capacity of blood. All of the possible outcomes and mechanisms just described relate to maximal oxygen uptake, which was the main focus of the research. But there was another, related issue, usually addressed indirectly in the research conducted at the GIH: does elevated maximal oxygen uptake increase performance? 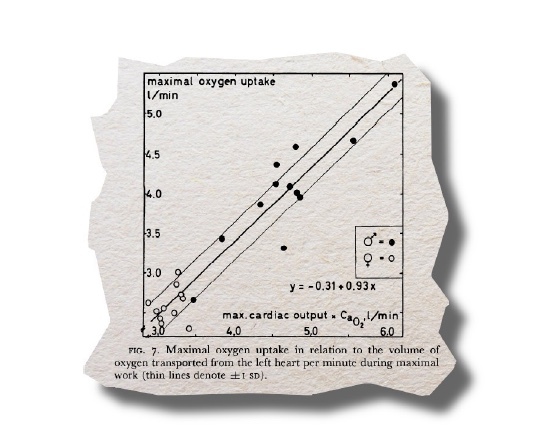 As seen above, particularly in the ’60s, maximal oxygen was seen having a lot of predictive power when it came to general sports performance, and while this outcome has been occasionally taken as given if VO2max was elevated, the Swedish researchers still paid some extra attention in measuring it. It was because of this performance aspect, why the method was simply dubbed “blood doping” or “blood boosting” in the media because its practical implications were clearly recognized. In the world of the scientific debates, this blood infusion line of research on manipulating blood hemoglobin concentration upwards, on the other hand, was described with technical names such as “induced erythrocythemia” or “secondary polycythemia” in the scientific literature. “We made experiments to find out the way that body adapts to different situations, lowering oxygen content, increased oxygen content, blood manipulation, atropine, or stimulations of different kinds”, Ekblom emphasizes putting the reinfusion research in the context. Ekblom’s mentor and coauthor Åstrand later wrote about rationale of the research and on the oxygen transport chain manipulation research emphasizing that “[i]n our efforts to manipulate with this system in order to reveal its adaptability, it was natural to modify the amount of the oxygen carrier, the hemoglobin content of the blood”. 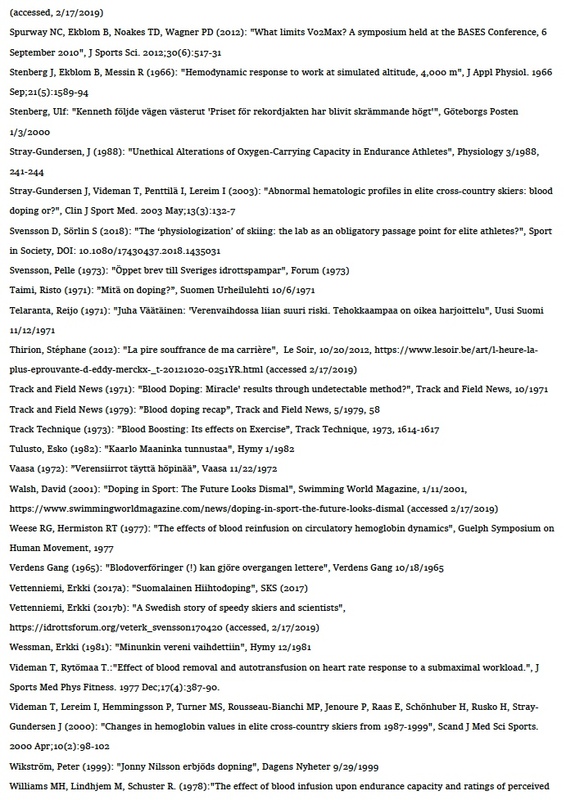 All these other similar types of lines of inquiry coincided chronologically with the blood reinfusion research, of which below is only a portion. One interesting and closely related research line focused on how combinations of different muscles and muscle groups affected the VO2max figure because it was known very early on that different testing protocols with different muscle groups gave slightly different figures. To summarize Part I, blood-doping research can be understood only as a part of the larger research trend focusing on the limiting factors of maximal oxygen uptake, as there was never a fully independent blood doping research. In simply following the way oxygen molecules move from the air into the muscles, the hemoglobin concentration of blood was a crucial but surprisingly under-researched aspect of that chain, which was given more attention to. While the research was unique, the idea of testing how use transfusions affected performance wasn’t a totally novel one, because a few research teams had actual infused blood and measured some performance-related variables. But this unsystematic preceding research had focused on elevating hemoglobin concentration in altitude adaptation context and on how changes in actual blood volume (ie. not hemoglobin concentration) affected heart function and circulation and recovery from anemia. Those lines of research differed from what the was now under investigation, and Ekblom recalled that he and Åstrand weren’t aware of this preceding research at that time anyway. This is part one of a multi-part series titled “Limiting Factors – A Genesis of Blood Doping”.